The date was postponed again. 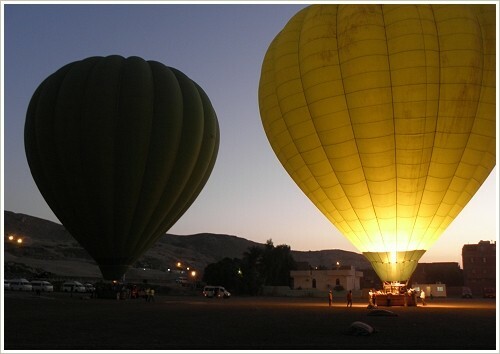 Finally, today in the early morning hours the first balloons returned to the sky over Luxor's west bank. On 26th of February, 2013 a calamity claimed the lifes of 19 people. Since then all balloon flights had been suspended. On Monday, the Civil Aviation Authority announced that the flights are set to resume on Wednesday, 17th of April, 2013 - however, without the company Sky Cruise, which was responsible for the hot air balloon tragedy, and the Ultra Magic N-425 model hot air balloons. The last 7 weeks had been used to improve technical standards and to increase safety measures as well as the the frequency of inspections and trainings for the pilots. Going forward passengers have to sign a document saying they are flying at their own risk. After discharge from a military hospital in Cairo the balloon's pilot, who is one of two survivors of the tragedy, faces charges of negligence and manslaughter. If you visited the lecture by Dr. José Manuel Galán, the director of the Proyecto Djehuti, on 17 February 2013 at the Mummification Museum, you already knew what others learned through press reports in the beginnng of April 2013: During the 12th campaign of archaeological excavations in Dra Abu el-Naga the Spanish Mission discovered two elite burials dating back to the 17th Dynasty (about 1540 BC) - a little-known period, during which Thebes became the capital of the Egyptian kingdom. At the end of January 2013 the team had already published the discovery of other findings of this campaign dating back to the 17th and early 18th Dynasty. 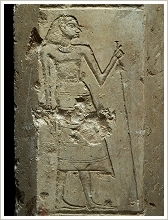 According to inscriptions, one of the recently discovered tombs belonged to Intefmose, “son of the king”. Probably, he was the son of Sobekemsaf I, one of the first kings of the 17th Dynasty, whose tomb is also located in Dra Abu el-Naga. At Intefmose's tomb the archaeologists found the access to another tomb, which belonged to Ahhotep, a high-ranking official. 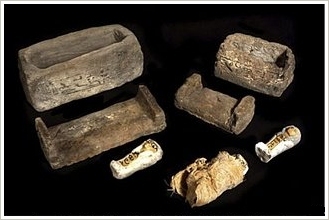 Three painted clay figurines known as shabtis were found there, each bore Ahhotep’s name. 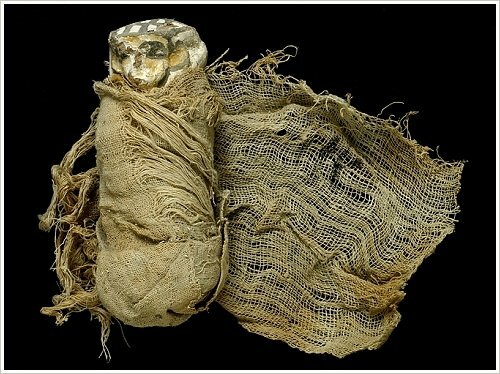 Two of them laid inside of both small clay sarcophagi, the third was wrapped in linen. 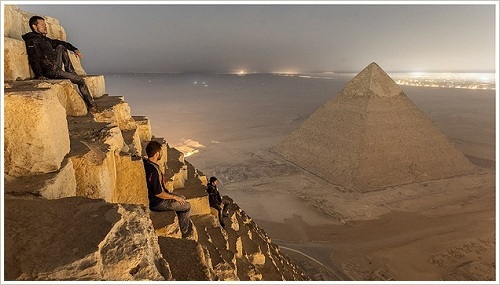 On 21 March 2013, at dusk after the official opening time, a group of Russian tourists scaled the smallest of the three pyramids of Giza: the 65-metre-high Pyramid of Menkaure - aware that they were threatened with several years of prison if they were caught - or just because of that thrilling fact. On the net one can read the report of a Canadian dating from 25 November 2009, who tells of his trip to Egypt in November 1980. He reports that the pyramid guardian's initial "Hello Mister! You come down, it is forbidden to climb!" changed rapidly into “You go up now” after he offered him a fistful of coins. Japan is the leading nationality of nocturnal pyramid climbers. It has become a kind of popular sport for them. The Japanese even left a handwritten Japanese and English book about how an unobserved climbing to the top can succeed in one of the hotels in Cairo. According to a report of 19 May 2004, two Americans who had lived in Cairo for one year made use of this knowledge. Initially, they climbed one of the small Queens' pyramids close to the Great Pyramid in order to watch the positions and walks of the guardians - and get caught. They got off cheaply, had been escorted out - and tiptoed back. Now to the 136-metre-high Pyramid of Khafre. They succeeded in climbing to the summit - and received visitors again: three Japanese tourists. They descented together - and got caught again. By other guards, which were less obliging and braught them to the police station. However, after a hour and a half they were released. 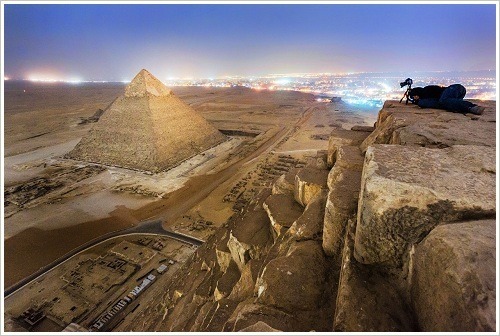 According to CNN on 9 April 2010 the Egyptian army removed an 24-year old Egyptian man by helicopter from the top of the Pyramid of Khafre, where he had scaled to in the night before. Next morning, when the poilice tried to arrest him watched by thousands of tourists he chucked pyramid rocks at them. Due to fear that he could be weaponed the police called for the army, who could apprehend him in the afternoon. The man refused to explain his motive. On 28 March 2013, one week after the Russian action, which had provoked not only enthusiasm, but above all indignation, Vadim Makhorov apologised via CNN to Egypt and the whole world: "We didn't want to insult anyone. We were just following the [childhood] dream." His mate Marat Dupri, however, sees that quite different. During an interview with the German SPIEGEL magazine from 31/03/13 he said: "As if that would mind a pyramid that exists in so long." By the way, the ban to climb the pyramids was issued in the 1980s - not for the good of the pyramids but due to recurring fatalities.